There is no escaping work. If we are having a bad day at work, it’s hard to shut it off and pretend like everything is fine. If one isn’t meeting the expectations of the other, you can’t just shut that part off when you are home. When things go wrong, and trust me they do, there’s no escaping. We each have our own roles: it’s important to have set roles so you aren’t both doing the same thing. This is easier said than done when running a small business, as it’s all hands on deck. We go on date night 1x/week: We do it during the week, since it’s easier to get a babysitter. We rotate picking the activity. We try really really hard to not talk about kids or work (but then sometimes it’s silent) :). Sometimes we go to great new restaurants and sometimes we do random things, like go to Dave and Busters or play tennis. We often work from separate places: we have a home office, but most of the time my husband will work from a shared office outside of the home, or a coffee shop. We put scheduled 1:1 meetings on the calendar: since we’re always together, it’s easy to fall into a routine where we don’t have scheduled meetings and just interrupt each other whenever we want. We’ve started to put two meetings per week on our calendar so they are dedicated times. 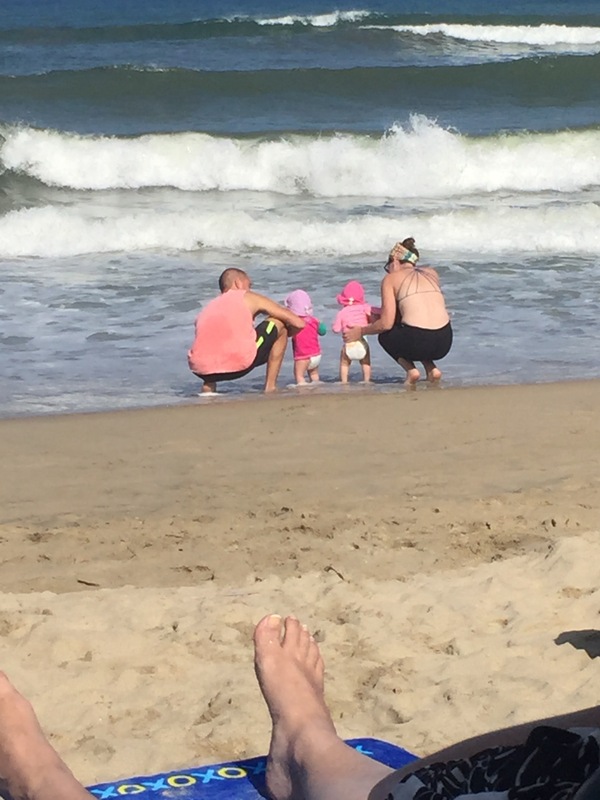 We pretend to have work trips so we can get family to babysit, when really we just go on a beach vacation… okay, this hasn’t actually happened yet, but we think it’s a genius idea (a perk of working together). Running a business together gives us the flexibility we need to run a young family, together. However, it’s so important to put your marriage and your partners needs in front of your business. If you have other suggestions or ways that you make it work, when working with your partner, we’d love to hear them! We are back! We took a little hiatus from the blog, but now we’re back. Since our last post, we had another set of twins. That’s right, a SECOND set of twins. Raya (girl) and Efi (boy) are now 7 weeks old. Their big sisters, Eyva & Noa (2.5 years old), have been infatuated with them, to the point where we need to make sure they don’t suffocate them or hurt them from hugging them too hard. While raising 4 kids under 2.5, Adam and I are still running our own business. Lately, we’ve been working with some really cool, up-and-coming bag companies, apparel companies, as well as doing some homewares (like Melamine plates, napkins), and accessories… Life is never boring, to say the least. We have some exciting trips planned – including a few international trips, so stay tuned for that. For now, we are Stateside at our new house in the Boston area, where we are super busy with the kids and work. Hope you enjoy all of our upcoming posts. During the past 30 days, our 18-month-old twins have spent 55 hours in flight, spanning 3 big trips; 28 hours from Saigon to Boston, 11 hours from Boston to Tel Aviv, and 15 hours from Tel Aviv to Saigon. In seven weeks, we will do it all over again. Are we crazy? Maybe. But, candidly, this seemingly crazy travel was far smoother than we could have ever expected. On our first 28-hour flight, we planned to fly with our nanny, so I had hoped that the ratio of 3 adults to 2 babies would work in our favor. Nonetheless, I was still intimidated by the prospect of spending 28 hours with my rambunctious girls on the plane. Then hours before the flight, our nanny fell victim to an unrelenting stomach bug and my husband was suffering from complications provoked by an earlier jelly fish attack. Despite the unforeseen challenges, the kids slept for almost the entire duration of the flight and the crew was very helpful. What follows is a breakdown of how we prepared, as well as a few tips and tricks. We purchased one extra seat for the twins and reserved one bassinet. The girls are a little big for the bassinet, but it works out really well when they fall asleep (we can’t put them in until they are sleeping). We always try to book the bulkhead, two aisle seats, and two children’s meals, and almost always gate check our stroller so that we can use it until we step onto the plane. We also always book night flights and try to ensure the kids sleep well the night before and take a good nap the day of. We want them to be tired when we get on the plane but not cranky. For clothes, we put them in onesies with socks and shoes, not the footie PJ’s. We want them to walk around before the flight (get all of their energy out – in fact, the gate is a great place to fun around because there’s not too much trouble they can get in) and don’t want the bottom of their onesies to get too dirty. We also bring their sleep sacks and put them on about 1 hour into the flight. In addition, we bring only 2 changes of clothes (for each baby). One in case they get their PJ’s dirty, and an outfit to change them into shortly before landing so we can attempt to make them look clean and refreshed (ha). We pack about 8 diapers for the two kids and 2 packs of wipes. We pack each child a small toy bag – each has the same toys because god forbid one kid had a toy that the other doesn’t. We usually bring our double stroller the gate and wear the babies in a carrier onto the plane. Once you get on board, have someone hold your baby and get organized. You want to have the essentials under your feet and the rest in the overhead compartment. I plan this out before when I’m packing the carryons. I put the essentials in the diaper bag and then have a second bag with back up supplies that I put in the overhead compartment. I always put a blanket on the seat where my kids will be, just to help keep some of the germs away. Wipe down the area around your seat, the belt, the buttons, the arm rest and the tray table. Don’t be too worried about the people around you – it’s quite loud on the plane and even if your child cries the whole time, you’ll never see them again! Have milk, water or snacks handy for takeoff and landing, as this will help with the pressure on their little ears. Bring 2 or 3 plastic shopping bags for trash and/or to put dirty clothes in. Buy bottled water before boarding but also bring a water bottle and have the flight attendants fill it up – staying hydrated is important. Utilize tissues (for ripping and playing), cups and airplane magazines. Most importantly, try and relax and don’t let your anxiety get the best of you. The most exciting adventures happen when you step out of your comfort zone and explore the world around you. A lot of people ask me what it’s like to work and live in Vietnam. The truth is, it depends on the day. Some days are amazing, incredible actually, while other days can be rather frustrating and inefficient. For some background, my husband and I relocated to Saigon, Vietnam for 6 months for our business (www.timroon.com). We help US companies with manufacturing here in Vietnam. Business is going really well and we are very busy. Half my time is spent on business development in the US, while the other is spent bringing on new suppliers and monitoring current manufacturing programs here in Vietnam. Most days I get up at about 6:30, workout (either play tennis, do yoga, go for a run or work out with my trainer – costs $12 per session), shower, help with breakfast and then I leave the house around 830/9. I ride my bike about 5 minutes to “town” and rotate between about 10 different coffee shops. For me, this is exciting; I constantly get to work in different places. For my husband, he’d prefer a set place. Besides consuming lots of coffee, juice and of course coconuts, I love the change of scenery. I can honestly say that I am so happy here in Saigon. Because of all of the help, I’m really able to focus on work. The nice weather (sometimes too hot), means that we are always active and there are so many activities around us. The proximity to other places means that we can easily travel on the weekends – whether it’s exploring Vietnam, or going to Thailand, Laos, Myanmar, etc. Most of the expats here are so friendly and I’ve really enjoyed making friends from all over the world. Life seems pretty easy here in Saigon and I am so thankful for this opportunity. Always changing landscape – we can work from anywhere. Whether it’s a coffee shop, a restaurant, our living room or from a boat. As long as there’s wifi and power, we can make it our office. Opportunity to Network – we are always meeting people who either work in manufacturing, do what we do or need things manufactured. Every day is a new opportunity to network. Inexpensive Labor – it’s true that labor is very inexpensive. We have a cook ($4/hour), a housekeeper and a nanny. When needed, we hire a driver (about $40/day). We also have an assistant that costs about $3/hour. We have employees here are on the ground in Vietnam whose salary is around 1/6 of what we pay at home. Labor is cheap and this allows us to focus on work, which is great! Time difference – being on a 12 hour time difference is very difficult to move things along. We often have to wait to get a response and vice versa. There are many nights where we stay up long into the night in order to be on East Coast time. This is one of the negatives about working abroad. The positive is that during the day our time, I have lots of time to respond to our clients in the US, since they are sleeping. Wifi – the wifi in South East Asia can be VERY frustrating. Some days it’s fine, but most days it is slow. Some times we even have power issues. In fact, right now I am using the hotspot from my phone because there is a power outage. Culture Clashes – The people of Vietnam are wonderful, but sometimes we have some culture issues when it comes to working. People will always say “yes we can do this”, but often times details are overlooked and turnaround time can be slow. We learned that we need to be very clear in our deliverables and constantly monitor the work to make sure it is getting done. Face to face meetings are best. Communication – Like any country, sometimes it’s hard to understand each other. Whenever we work with a new factory or a new person, I always make sure to start a Whatsaap group so we can text to make sure what we say is understood. Air Quality – This doesn’t affect my work per se, but a huge negative is the air quality. Some days the AQI will reach over 150, similar to Beijing! We can seldom see a blue sky and this makes us worried for our children. If the air was clean, I would strongly urge everyone to pack up and move to Vietnam! Do you work abroad? What are your likes and dislikes? 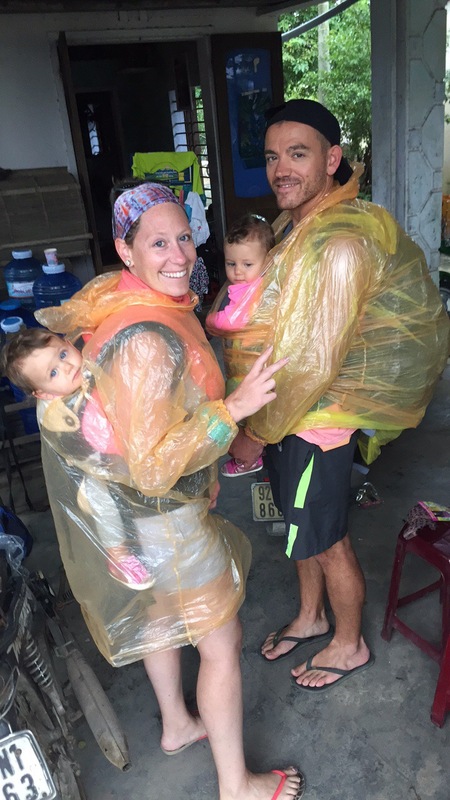 While on a vacation from our base in Saigon, we went on a two week trip with our twin, 14 month old toddlers, and packed in only one bag. True story. How’d we do it? Two ways: 1). We packed in Gobi Gear’s stuff sacks and 2). we didn’t bring much stuff. That said, we did laundry about 2 times per week. Each one of us got one Hoboroll or SegSac and we put all three (twins had to share) in one large backpack. We swear by Gobi Gear’s stuff sacks – they make packing WAY easier, allowing us to stay organize and pack more into less space! After one week in Laos, we flew back to Vietnam and spent nearly a week in our favorite place, Hoi An. Originally we were supposed to go the previous week, but there was severe flooding, so we postponed. We stayed at the homestay’s (guesthouse), Pham Gia, which we found on Tripadvsior. Unfortunately, because they are so popular and only have 9 rooms, they only had one room left for us — not another one for our nanny, Sara. Thankfully, the owner arranged for Sara to stay at a guest house right next door. We arrived after midnight after two quick planes from Luang Prabang to Hanoi. The layover was longer than anticipated due to flight delays. I had brought some food with us from Laos, to make sure the twins had dinner. They’ve been very picky eaters lately and it’s been frustrating. We got pizza and a salad to go and took it on the plane with us. Flying with the girls has become very easy — well, each flight is only an hour. We have a good system down; feed them, nap them, play with them, land! The weather was chillier than we expected, but at some points it got warm. With only one bag between the four of us, we did laundry several times at the homestay since the girls didn’t have many clothes (thank goodness we bought them multiple pairs of monkey pants at the night market in Laos). We had breakfast every morning at the homestay — the girls loved their scrambled eggs and banana pancakes. The staff at the homestay was incredible and fell in love with our girls. Every chance they had, they would take the girls and play with them. It was great until we realized that one day they had fed them 10 donuts, we were not happy and neither were their belly’s. The Vietnamese women tried to explain that the cream in the middle was good for the babies…ya, okay. We arranged with the homestay for one crib, as we brought our one Baby Bjourn travel crib. In hindsight, I wish we had just brought two, as it was difficult to ensure that the places we traveled to had cribs. We also brought our lobster chairs but all of the tables had a lip and therefore we couldn’t clip them on. We went out for dinner every night. Hoi An has amazing food and it’s much cheaper than in Saigon. The kids only lost it one night, otherwise they were very well behaved at night. We can actually say that the girls learned to walk under the famous lanterns of Ancient Town, Hoi An. One would think that they were celebrities – at any given moment there were swarms of tourists taking their pictures. We caused quite the spectacle! Funny story here. On our last day, I had told Adam that it looked like a beach day. We got bicycles from our homestay and started to venture to the beach. We wore the girls, unfortunately they didn’t have any bicycles. Instead of taking the boring, 10 minute ride to the beach, Adam decided that we should see some rice paddies. 20 minutes into our ride, it started to downpour, so hard that we couldn’t go further. We stopped at someone’s home (a bunch of men were drinking beer and playing cards outside). They gave us ponchos and we waited for the rain to calm down. Finally, we set out, started to pour again, wind picked up, and we biked this way for about 45 minutes to the beach. We got to the beach and the we were the only ones there. We waited out the storm in a nice beach bar, which we had to ourselves, and got the girls to take a nap (while we drank beer). For the first time, we got to celebrate a real Christmas — well, a Vietnamese Christmas. Our homestay treated us to a beautiful Christmas Eve dinner with the other guests. They cooked so many different Vietnamese specialties, it was delicious! After dinner we went to the Church, where thousands of people gathered to celebrate. We had the babies there until about 1030PM. All of the other babies were dressed in down jackets, hats and gloves – let me remind you that it was probably 60 degrees – and our girls were in sleeveless jumpers! On Christmas Day we went to a nice brunch with Sara and walked around the town. 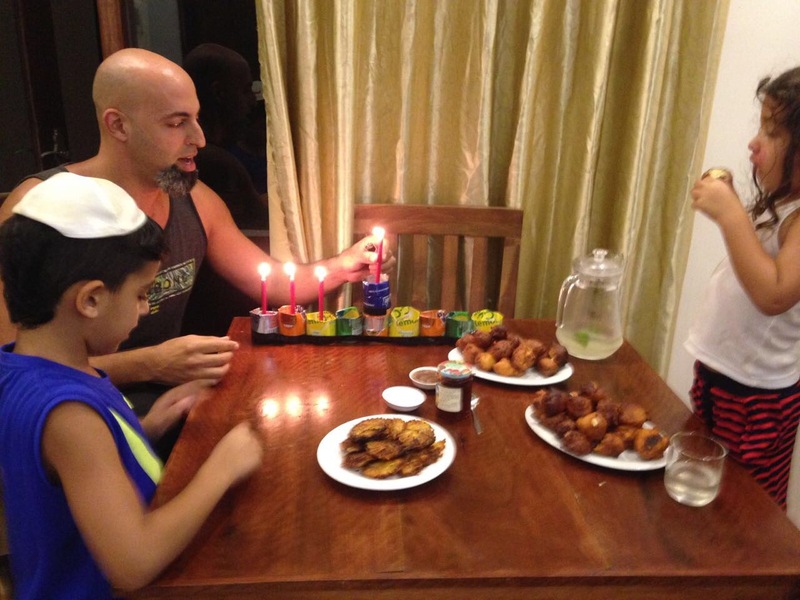 We happened to meet many Israelis and others celebrating Hanukkah. Not only did we get to Celebrate Christmas, but we also got to celebrate Hanukkah, which happened to fall on Christmas. 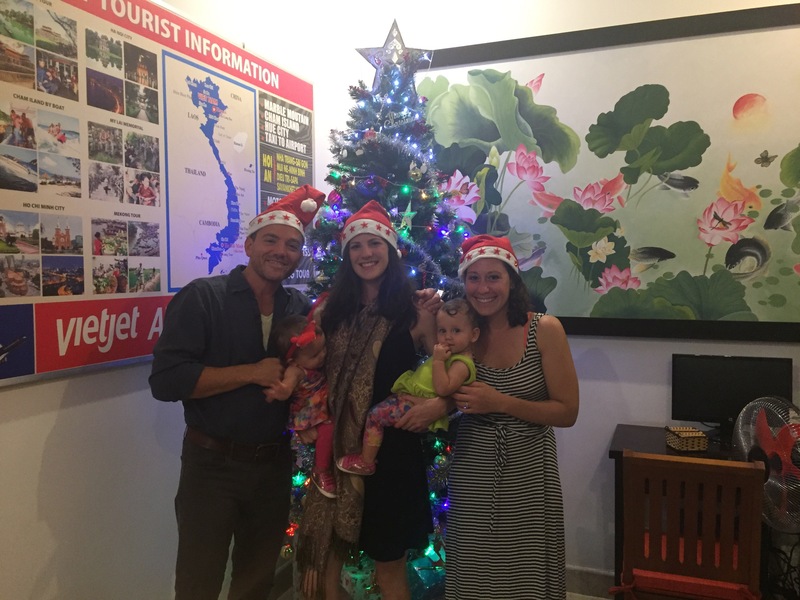 We met an Israeli family in Saigon (amazing family – they are travelling with their three kids around Asia for 10 months!) that happened to be in Hoi An at the same time. They invited us over and cooked sufganiyot donuts, latkes and had a homemade menorah. It was so awesome. We had a wonderful week in Laos with our 13 month old twins! We traveled from Ho Chi Minh to Luang Prabang (via Bangkok). We were originally supposed to travel to Laos the following week, but with all of the flooding in Central Vietnam, we switched it last minute (like the day before). Twin B is not wearing pants because she had a little accident. Note to self: bring extra pants! The flights with the babies were very easy, as each leg was only around 1 hour. However, we had a 2 hour layover so the entire travel felt a bit long, but manageable. Upon landing in Luang Prabang, we could see the gorgeous mountains and greenery. We booked our guest house literally as we landed at the airport (we saw some great reviews on Travelfish), and chose to stay at Villa Saynam, a stone throw away from the main street with the night market. At the airport, we got our visas on arrival ($30/person) and packed into a van taxi. Our guest house was nice – clean, basic, with a wonderful staff. We chose a room on the second floor, as we heard they were nicer. The only problem was that they didn’t have any baby cribs; we brought one Baby Bjourn travel crib but figured wherever we stayed would have at least one… we were wrong! We got creative and ended up putting a mattress on the floor, next to the bed and moving the bed over so that the floor mattress was protected on three sides. Then, we put the second crib in front of the mattress so essentially we made a crib (or a baby jail). Our makeshift crib. I think one twin was jealous that the other got all the space! The staff at our guest house was amazing with our kids — in fact, everyone was amazing with our kids! Each morning they had omelets and fruit waiting for the girls and would take them out of our arms and play with them while we ate. Yes, we took the twins on a FULL DAY hike! We wore them in their carriers and they actually got a 2 hour nap on us. We had to drive one hour in the back of a tuk tuk on a very bumpy road. The girls enjoyed the ride so much that they fell fast asleep. In addition to trekking to the waterfall (which at times I was in tears because I was so scared that I was going to fall), we loved having lunch at a remote butterfly garden. We got to jump into the falls – not with the kids of course. Twins eating at Utopia Cafe – a must visit. Favorite restaurants included: Secret Pizza (10 minutes outside town, only open Tuesday and Friday – AMAZING), Dyen Sabai Restaurant (across from Bamboo bridge – amazing Lao food, our favorite! ), Coconut Garden, and Blue Lagoon (fine dining – everyone’s favorite). The thing to do in Luang Prabang is to rent bicycles and explore. We got two bikes with baby seats and put the kiddos in the seats. The only set back was that there were no helmets (and this made me very nervous). After a few hours, we decided to put on our carriers and wore them in front of us. It felt safer and the girls liked it more because they had a front row seat! Seeing the town via bicycle is super fun and a great way to see everything. We spent half a day at the beautiful Pha Tad Ke Botanical Gardens. To get there, we took a 15 minute boat ride from town, across the river. The kids loved it! We had the stroller (not recommended) and we had to carry it down about 200 steps to the river, then 200 steps up to the gardens. The gardens themselves were very interested and we really enjoyed walking around. Our highlight was probably sitting at the cafe and experiencing a tea tasting, as well as their delicious food. The kids liked their smoothies. Admission is $25/person. we did this on our own by paying someone on a boat to take us across, then we walked around. So. Many. Temples (well, not as many as in Bagan, Myanmar). Today we had a pretty epic day. Not only was it daddy’s 32nd birthday, but the twins got to explore the Mekong Delta, via speedboat. Old Adam and Marissa would have taken a 5 hour bus ride deep into the Delta, followed by a home stay. But now that we have children, we decided we needed to be slightly less adventurous, just slightly though. We opted instead for a one day trip with a well-reviewed boat operator, Les Rives. The day started early — we also realized upon waking up that we only had two diapers left and twin B had diarrhea (yikes). I texted a mom that we met in our compound and she gave me a few diapers to take on the trip (note to self – don’t let the diapers run low). We packed a bunch of snacks, hats, sunscreen, change of clothes, and alas, diapers. The boat had 11 people total on it and was a nice speedboat. They had lifejackets, but for adults only, so we held the twins in our arms and hoped that the propeller didn’t hit any of the crazy debris that was in the water. The Mekong Delta, called the “rice bowl” of Vietnam, is the region in Southwestern Vietnam that flows all the way to Cambodia. In fact, our apartment is right on the river (In Ho Chi Minh) and we see all of the boats pass by, transferring transferring goods from deep south in the Mekong. The idyllic scenery is filled with fruit orchards, rice paddies, canals, streams, boats, houses and floating markets. It’s also filled with sewage and tons of debris, sadly. Our boat made a brief stop at the Tuong Van Pagoda, where we learned more about the importance of Buddhism to the people of the Delta. After the Pagoda, we went to a local market, where we spoke with an 80 year old woman that has been selling eggs in the same spot for the past 40 years. From there, we turned off the river into small, winding canals of the Thu Thua area, where we visited a traditional riverside house. Here we met two sisters who served us fresh coconuts. The twins really enjoyed the refreshing coconuts. No trip to the Mekong could be complete with out some local whiskey. The group sang happy birthday to Adam over some whisky shots. Lunch was incredible; served at a local pagoda and included multiple courses – spring rolls, soup, rice, chicken, and a fried elephant fish. The best part of lunch was when our tour operator took our children so we could eat. They brought them into a local house where the locals played with our girls – we heard laughter and singing, so we were okay with it. It’s becoming a theme in Vietnam, nice people watching our children so we can eat! We returned back home around 5PM. Our girls were allstars. They had smiles on their faces the entire time. They got some quick shut-eye while we were on the boat, in our arms, but other than that, they were troopers. We were so proud of them! Today was a fun day! 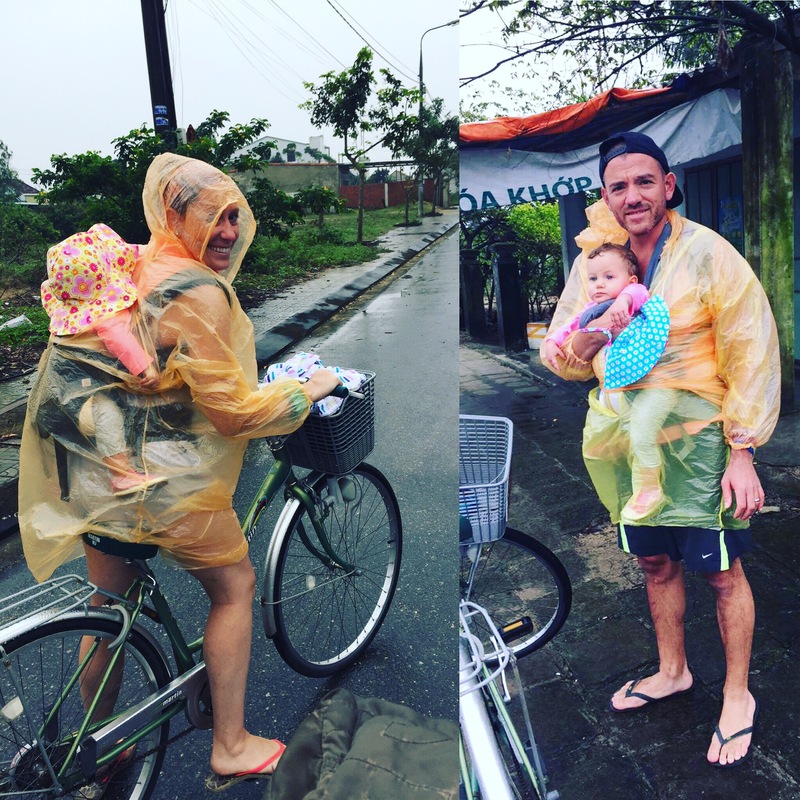 We took our twins (and nanny) on a little adventure; an unplanned exploration of the alleyways of District 4, Saigon. Up to this point, we’ve gone to the main attractions and have explored where we live in D2, but we’ve not gone down the small alleys, the areas where the locals live. Our adventure started off at Xom Chie Market. A sprawling market filled with food stalls, fruit and vegetable stalls, dried goods and meat and fish. The smell was overwhelming at times but the colors all around were vibrant. The only annoying thing was that everyone tried to touch our babies. We constantly had to say no and block them with our hands. I really enjoyed that no one was hassling us to buy from them, but there was a lot of pointing and laughter when we walked by! After the market, we kept veering down side streets and would get lost in the alley’s. I was nervous; between hearing stories about getting mugged, trying to navigate around the motor bikes, seeing stray dogs and on top of all of that, being weary of mosquitoes (supposedly there is Zika here). However, looking back, we were in no danger and we had a phenomenal time. One of the streets brought us to a nice family celebrating their daughters first birthday. They gave us balloons for our kids, as well as some snacks. After that, we came across a wedding where the bride and the groom asked to take a photo with us. After corralling the back streets, we did what we did best — found some delicious street food. The kids were amazing — we wore them the whole time. They loved interacting with everyone and joining on our adventure. We brought them lots of snacks, including water, rice cakes, pouches and some animal crackers. As soon as we got into the taxi to come home, they passed out! City Mini GT Stroller – we bought a used one since we’d be schlepping it around and checking it on airlines. I also didn’t want to bring a new one in case it got stolen or damaged. We love the big wheels (great for “off-roading”), big sunshades and how easy it is to fold up. Phil & Ted’s Lobster Chairs – a must for feeding. We use them in our apartment when travelling as well as at restaurants. Babyganics hand,f ace and baby wipes – use them for everything!